A special touch for Easter fun on a traditional favorite. Cut cooked eggs in half lengthwise and remove yolks; mash yolks in a bowl with creamy salad dressing, salt, black pepper, hot sauce, and dry mustard until smooth. Place red, blue, and green food coloring into 3 different bowls and add about 1 cup water to each bowl. Steep 8 egg white halves in each bowl, tinting the egg whites pink, light blue, and green. Drain colored egg whites on paper towels. 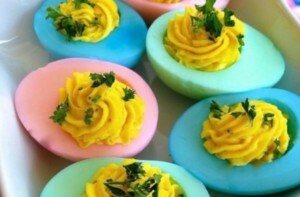 Pipe or spoon egg yolk filling into colored egg white halves; cover and chill before serving, at least 30 minutes.